If I have a routine or something I love, I repeat it for a long time. My roommates would tire of hearing the same music droning from my room and my children have complained about visiting the same treasured bookstore. Thankfully I have friends and a husband that push me to try new things! But recently, for my health challenge, I decided to go with what I do best ~ familiar and repetitive. I read an article listing the best thermionic (fat-burning) foods your body can consume and it listed: oatmeal, yams, sweet potatoes, multi-grain cereals, whole-grain bread & pasta, brown rice, broccoli, spinach, salad greens, asparagus, grapefruit, oranges, apples, blueberries, pears, cantaloupes, chili peppers, paprika and caffeine. I decided to start with breakfast and simply exchange what I had been eating for oatmeal. I've had oatmeal with blueberries (no sweetener) everyday and I'm loving it! I sprinkle a little cinnamon and a teaspoon of flax-seed in to help the flavor and maximize the results. It's been really satisfying and keeps the hunger at bay for longer. 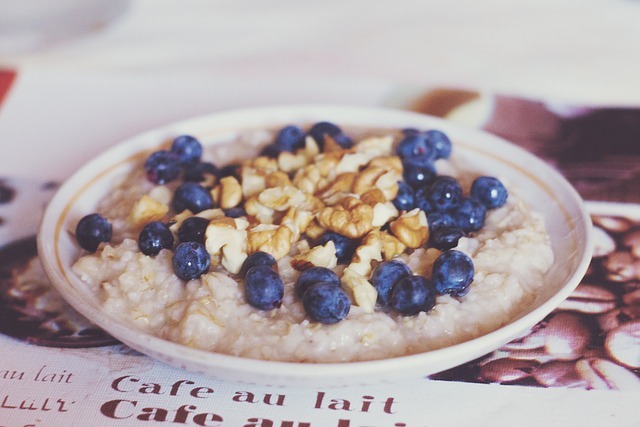 HighCarbHannah once explained that oats like street-sweepers for our body pipes. I've always been a fan of oatmeal, so this hasn't been hard to incorporate. I know this level of repetition is not for everyone, but it works for me! Such a simple first step. I've also been walking daily. I've mentioned this before, but I find it so much easier to walk everyday when I don't require myself to go anywhere. Sometimes I walk around the neighborhood and sometimes I just walk inside my house. I try to make it fun. Either I dance-walk with my favorite songs, or I walk while listening to a podcast or audio book. Books and music are my passion, so it makes the yucky exercise part seem less daunting (the yucky exercise part is growing on me too). Another exercise I love is yoga ~ not super hard yoga, just basic stretching. Yoga with Adriene on YouTube is my favorite because she's quirky and chill. She makes you feel amazing just for showing up! After my post a few days ago, I got more recommendations from friends about other exercise channels I should try. I'm going to check them out and let you know what I think! What easy tips have you found helpful for a healthy, happy life?